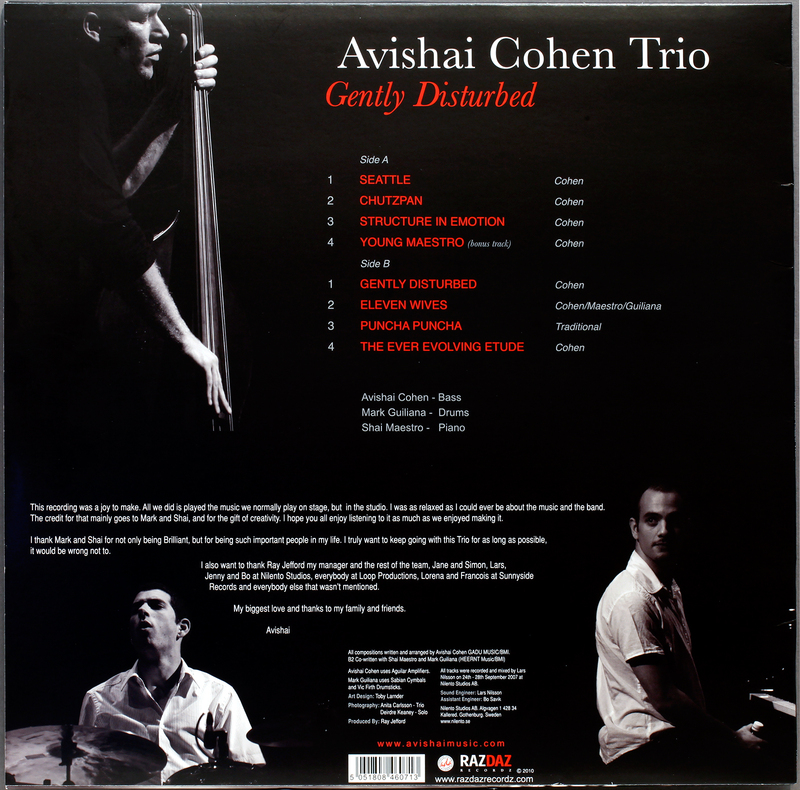 Avishai was a discovery playing with Chick Corea, and has a dozen excellent and stimulating CDs, of which I have all. After a decade on the US jazz scene, he returned recently to his native Israel. He took the Antibes Jazz Festival by storm the other year and his live appearances have been enthusiastically received in Europe, so may be he will return to these shores. A brief excursion out of my usual timezone of 1956-66 but occasionally you need to step outside to see what else is going on. “Not so fast, Londonwhatsyourname – this isn’t American jazz of the Fifties and Sixties!” Yes it is LondonJazzCollector here, you haven’t suffered a browser hijack. One of the odd times I stray beyond 1970, Avishai Cohen has been one of the few contemporary modern jazz musicians I listen to, along with Brad Mehldau, Erik Truffaz and occasionally Chick Corea. I’ll let the CD reviewers do the heavy word lifting as regards the music: “Metric modulation and complex polyrhythms that gradually evolves into a Latin-flavored, clave-fueled workout”…” virtuosic soloing and lockstep harmonics that find the trio playing tricks with time and space in a wholly intuitive manner. Cohen’s bass work throughout is consistently inventive; he thoroughly enjoys toying with dense, interlocking rhythmic surprises…” Yeah. He’s good. Usually this more recent jazz comes on CDs. You have no choice, as that is the format it comes in. 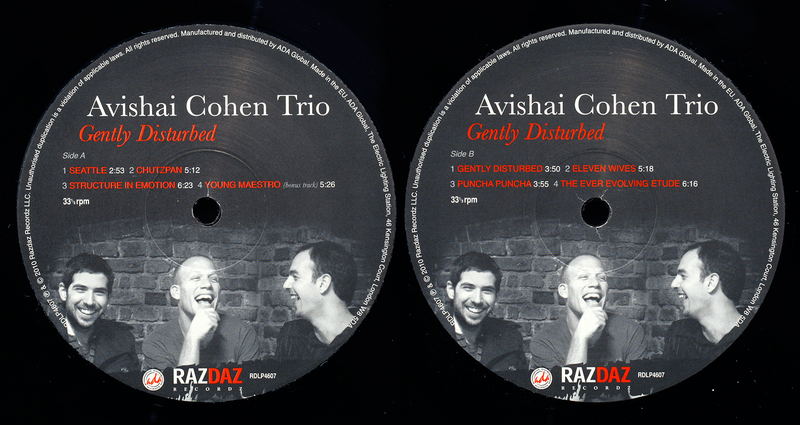 I was surprised therefore to see one of Cohen’s best records “Gently Disturbed” pressed on vinyl. As I already owned the CD, as a vinyl fan, I thought I’d give the vinyl a go. What a disappointment. This modern vinyl is significantly worse than the CD. Digitally recorded, digital production throughout, and then contracted to a bucket shop to plop it onto vinyl at the end. Weak and lacking presence, the insistent driving percussion of Mark Guiliana is reduced to the ticking of a grandfather clock, and it makes this exciting composer/bassist sound dull. Listen to the same track ripped from CD for comparison (as an aside, which is a little louder).I expect the trendy Kensington “RazDaz” record production staff don’t have the slightest idea what they have done, and why should they? It’s vinyl, vinyl’s cool. No it isn’t, if listening feels like being hit around the head with a wet Kleenex. Hey dude, what happened to the top end??. It’s crap. A great album on CD but I wouldn’t bother with vinyl. It’s pointless. The CD is in this case much more lively and engaging presentation, and you can enjoy the music more and have the convenience of CD. I had the same experience with the Sam Rivers Blue Note “Inventions and Dimensions” CD, where the late 70’s vinyl Blue Note by United Artists (its only release) is a total audio disaster. Lesson learned: vinyl mostly beats CD except times when it doesn’t. 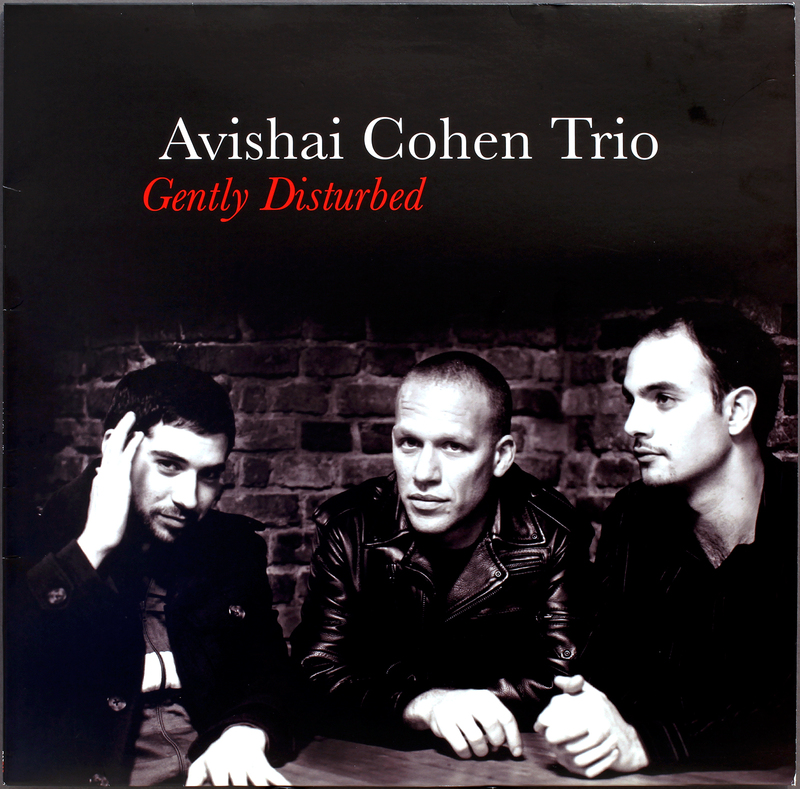 This entry was posted in Avishai Cohen and tagged Avishai Cohen, Mark Guiliana, Shai Maestro by LondonJazzCollector. Bookmark the permalink. I’m not sure what value there is in returning to a five-year old post (I can’t be the only one that reads “back numbers” of the LJC site, surely? ), but here goes. First, I wonder whether any vinyl mastering/reissue developments in the past five years have made John rethink his gloomy (but deeply informative) analysis above? With over 800 posts on record, which I deliberately leave open for comments , unlike some sites, and no Captcha screen to prove you are human (you are human aren’t you, Alun?) I am delighted when readers dig into an old post. Some of the jokes have stood the test of time, and I am often surprised how insightful I was, despite not knowing very much in those early days. I don’t know if John is still around, but if you are here John, give us a sign. Of Mr Cohen, I had the pleasure of seeing his namesake, the trumpeter Avishai Cohen, the other year, and he was magnificent. It is probably not helpful for two musicians to have the self-same unusual name, but both are a good listen. In response to John’s extensive comment I’d like to add another name that is -still- legendary and that’s the one from Herb “Pump” Powers, Jr. His work on countless 12″ singles and albums is absolutely outstanding. Granted, you have to be into disco, house, hiphop, R&B and all other kinds of modern day black music, but then still we can safely call him the Rudy van Gelder of black music in my opinion. When Herb mastered a well produced disco single (and believe me: amongst all the crap released in those days there actually are superbly recorded, well produced, high quality disco songs that will live up even the dullest get together), then your room would be filled with the absolute best sounding stuff you could ask for. Full in the lows, subtle in the highs and velvety in the mids. Killer material for at home or in the large clubs sporting legendary sound systems. Read about him HERE and make sure to click on the history button to read the interviews with Herb. Also note the photo of Herb standing next to his cutting machine, just like Rudy does in one of his legendary snapshots. And in reference to George “Porky” Peckham: just flip through eBay and type something like “porky in trail off” in the search field; within seconds you’ll know what he is all about. A legend. Read more HERE and HERE (about the “three sided” Monthy Python LP) -Last but not least THIS video by George Peckham is a very nice watch. As they say: “they don’t make ’em like that anymore…” -It’s these guys that gave the world the fab sounding vinyls we cherish. I totally agree. Some of those hip hop mastering jobs were absolutely marvelous. A mastering engineer in the USA told me that the first 12” single (I forget the title) was actually made because the mastering suite had cutting run out of 7” lacquers . They ended up using a 12” lacquer and when they heard the volume it blew their minds and the gradually the word spread. Herb Powers Jr. at Frankford/Wayne mastering in NYC was pretty hot. I still have some of his great work like Double Dee & Steinski – The Lessons on Tommy Boy. I also recall some of the Sugarhill stuff sounding extremely powerful. Another all-time fave for mastering is the original UK pressings of The Clash’s London Calling. The opening track sounds incredible. It’s so sad that future generations can’t hear that anymore – the current CD re-masters are a pretty disgraceful. I run a record label and have supervised many vinyl mastering sessions at studios like Abbey Road and Sterling Sound in NYC and the simple fact is that those skills have been lost, quite possibly forever. In one instance I was reissuing a 70s single and using the original ¼” master tape. The reel has remained unplayed for 35 years. It wasn’t Ampex so there was no shedding and it hadn’t been baked. The session, with one of the best mastering engineers in the UK, seemed to go well but when the test pressing arrived, and I compared it to the mint original 70s vinyl pressing and it collapsed like a card castle. The process of cutting a vinyl record and pressing it is a highly sophisticated craft that engineers took years to master. I read how many of you salivate over the RVG stamp and with good reason. Back in the 70s rockers did much the same thing when they saw Porky etched in the run-out groove. Of course Van Gelder is the king of vinyl but now there is no king or even a castle for that matter. Vinyl mastering is an adjunct to the principal business of creating highly compressed masters for digital download – music whose principal platform will be a cheap set of headphones on a subway train or at best a tiny boombox in a kitchen. Gentlemen, we are now among a highly select group of music consumers – people that actually own great hi-fis with a decent turntable. We are as rare as owners of videocassette recorders were in 1970! And the quality of vinyl mastering has drastically declined because there is no significant audience for it at the moment. Sony have created what I call the “Tin Ear Generation” through the Walkman and any other number of shrill compact sound carriers that place portability over quality. To all those who have bought a contemporary vinyl reissue of a “classic” LP – the comparisons with original 50s and 60s pressings are at best depressing and at worst horrifying. I have allowed a couple of the big vinyl reissue companies to license our titles and the results are shoddy at best. They are perfectly happy to master from a CD and most major labels just provide them with a 16-bit master. Mastering a vinyl LP from a 16-bit source rather than from the original ¼ inch is like blowing postcards up to make posters. They think because they press it on 180gm vinyl that it is somehow imparted with greater fidelity and for the most part the benighted public buy it. But in mastering the source is everything. Without the best source tape you may as well press it on a flexidisc. A tip for you all – if you’re thinking about buying vinyl that’s been pressed in the last twenty years, forget it. No one engineering or manufacturing that plastic slab will have given it a 100th of the thought you’ll be putting into listening to it. 1900-1986 stick with the vinyl/shellac 1st pressings. 1987-2011 settle for the CD. I think this is a wonderful site and I’ve enjoyed the silent camaraderie I’ve felt with our host and many of those who post here. It has certainly kept me sane to read letters from people who love music for how it sounds and care enough to source and investigate the best pressings to take them to their sonic nirvana. In time I think the pendulum will swing the other way back to richer sonic soundscapes and quality hi-fis…but that’s another story. The winner of the star letter award each month will receive a fully specified Linn Sondek LP12 SE (£9550). You wish. May The tracking Force be with you. You’re welcome, but I have to credit your site for inspiring the post. It’s great to know there are people out there that share one’s passion and interests. I’ve not come across another site like this where excerpts of the music are playable, the composition, performance and recording is discussed (often with great humour) and the acquisition of the record itself is recounted in a manner that replicates how I might feel walking into that dusty shop or bidding on the auction. The pictures are marvelous too. But most of all I have learnt more about Jazz here than anywhere else. May the tracking Force be with you too. An excellent — if somewhat depressing — post. Many thanks. All praise to your detective instincts, Lieutenant. Rather than turn the vinyl into a large coaster I thought it might make a scientific experiment. Interesting how even a simple A/B test finds it out. Hmm, this does tend to bear out my personal theory — that music engineered and recorded digitally for CD gains little if anything from a vinyl pressing. There are some exceptions to this: personally, I prefer almost any vinyl pressing of Blue Notes to the dismal CD transfers of the late-80s and very early 90s. Even the French DMM pressings are preferable — just. I used to take a similar view — if new jazz wasn’t pressed on vinyl then I ignored it. How wrong I was. Stuff that I have bought over the past six or seven years on CD has offered some of the most stimulating listening possible — John Taylor’s glorious trio and quartet records, the run of superb work from Tomasz Stanko, some of the Andrew Hills that never made it onto record (or anything at all) when they were first cut for Blue Note, some of the Keith Jarrett standards trio discs, some of the Paul Motian/Frisell/Lovano trio CDs, Stan Tracey….the list goes on. And had I stuck to my self-imposed “no vinyl-no buy” policy I would have missed it all. Thank you, I was wondering if I was going to be out here on my own with this post! It is interesting how there are no black and white absolutes, like “vinyl is better than CD” or vice versa, as you sometimes find young turks writing on forums. Life comes in infinite shades of grey. The Andrew Hill’s you mention – any particular albums to look out for? I like Andrew’s Blue Notes, and I have a Soul Note (Italian) which is good, but I’m in the dark about his later works. Well, they fall into three categories I reckon: Blue Notes that didn’t get a release until many years after they were cut and were CD-only; non-Blue Notes; and the batch of (to my ears at any rate) often startlingly good records he made in the last ten or twelve years of his life. In the first category I like PASSING SHIPS, a larger ensemble recording made for BN that went straight onto the shelves and wasn’t released. A friend who is better informed than me says probably because the ensemble playing shows signs on under-rehearsal. I also like GRASSROOTS, which I think was a 1968 set but not released at the time — but that one is (if memory serves) still floating around on late issue BN vinyl. IN the second category there were a number of records cut for small labels and one or two Japanese pressings. DIVINE REVELATION (Steeplechase? ), NEFERTITI (East Wind?) and BLUE BLACK (East Wind). And of course the handful of solo piano LPs which require hard listening but really shouldn’t be missed — FROM CALIFORNIA WITH LOVE (Artists House), FACES OF HOPE (Soul Note), VERONA RAG (Soul Note), and maybe another too, I can’t remember (yes: STRANGE SERENADE, which I have never heard). All of those should be available on reasonably cheap vinyl. The solo piano work was also collected in Mosaic #23, which I think may have been deleted. (Oddly, I’m just playing the second disc as I write). IN the third category, he had a purple patch in the 2000s: DUSK, and TIME LINES (his last recording, I think) have some lovely stuff on them. I wouldn’t miss those — perhaps especially TIME LINES. There’s a good discography here — you can see from it that he recorded a huge amount of stuff in 1968 especially; I guess BN felt they just had too much to release and stuck them in the vaults. Several came out in the early 2000s but some of the material (in dribs and drabs) had previously been on very late issue Blue Note compilations (the ones with the matt brown sleeves, usually doubles) — one was called ONE FOR ONE, I think. Yep Agree totally listening to the samples!